With over 100 colleges and universities, there's no shortage of colleges in Kansas. The Kansas Board of Regents system oversees six public universities, one municipal university, and 22 community colleges and technical schools across the state, plus Kansas is home to several private liberal arts colleges. Read on for critical information about Kansas colleges and universities, including school rankings and financial considerations, to make a well-informed decision. The following rankings provide an excellent starting point for researching colleges and universities in Kansas. Our team of higher education specialists and data analysts set quality criteria and evaluated statistics from colleges across the state to find the institutions that shine brightest based on factors like student-teacher ratio, tuition, and graduate earnings. 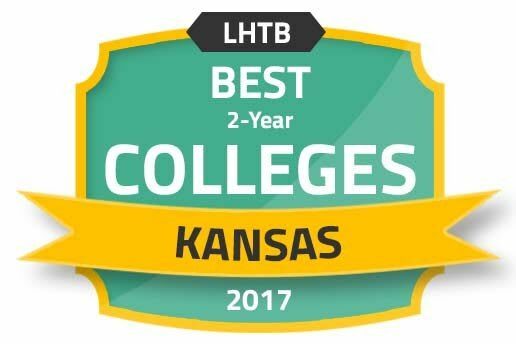 Learn more about the best two- and four-year colleges in Kansas below. Making a direct comparison between colleges in Kansas is one of the most helpful steps in the school decision-making process. The following tool lets potential students search and compare schools based on name, location, tuition range, type and size of school, subject of study, and degree level desired. This program is part of the national Accelerating Opportunity in partnership with the Kansas Board of Regents and the Kansas Department of Commerce. Its goal is to increase Kansas' skilled workforce and break the cycle of poverty by helping adult students get their high school diploma or GED while simultaneously earning post-secondary credentials and degrees. Students can take adult basic skills courses while getting technical career training in areas such as healthcare, aerostructures, welding and manufacturing. Tuition assistance may be available through the AO-K Proviso and GED Accelerator, and TANF-eligible students may qualify for a tuition scholarship. This initiative prepares high school students for technical college and careers while also providing Kansas with a skilled workforce in high-priority fields. The intended outcome is for students to graduate high school with professional credentials and the ability to enter the workforce in a high-need occupation, or continue on to use the credits earned to complete a post-secondary degree while earning high wages. An individualized study plan is created for students based on a specific Career Cluster skill set that continues through the first year of college. Students may qualify for free tuition to use towards approved programs at Kansas community colleges. This program is offered through the Kansas Foster Child Education Assistance Act and will waive college tuition and fees for eligible students that have aged out of foster care, or were adopted from foster care at or after the age of 16. Students interested in applying should check the full list of requirements regarding foster care to see if they qualify. Qualifying students must be pursuing a diploma, certificate, or degree program at a participating college in Kansas. Tuition will be covered through the semester that the student turns 23, and students must remain in good standing with the college they are attending. Education expense is major factor for almost all college students. The following section takes a closer look at the cost of college in Kansas. The three charts offer a comparison between average tuition in Kansas and the national average, including a look at in-state vs. out-of-state tuition. They also provide details on financial aid, including the percentage of students receiving financial aid and the amount they receive. An alternative, and often more accurate way of thinking about the cost of colleges in Kansas is to look at net price, or the cost of attendance minus financial aid received. The following list uses net price to rank the top-six colleges in Kansas. The national average is included for comparison. It's time to look at what graduates from colleges in Kansas are earning. This can be a good indicator that students will be using their tuition money wisely. The following six Kansas colleges are ranked by highest-paid alumni 10 years after they graduate. A comparison to the national average is also shown. Another way for students to check their educational investment is to look at how much Kansas college alumni owe in student debt after graduation. The following list is a ranking of the top-six Kansas colleges producing alumni with the least amount of student debt, with a comparison to the national average. Once tuition costs are examined, students still need to factor in their cost of living expenses when deciding on colleges. Expenses vary significantly based on location, but luckily, the cost of living in Kansas is lower than the national average. Take a look at the following table to get a better idea of what cost of living is like in Kansas and five of its largest metros. When researching colleges, students should ensure they are accredited. Accreditation is achieved when a college has met specific criteria and quality standards set by a recognized accrediting organization. In addition to affecting quality, attending an accredited college can affect several other aspects of a student's educational experience. For instance, applying to graduate school or for financial aid, professional licensure, and future employment may require attendance at an accredited school, and transferring credits from a non-accredited college may not be possible. The regional accrediting body for Kansas colleges is the Higher Learning Commission (HLC). Other national organizations accredit specific programs and departments within colleges. Some examples are provided below. National Council for Accreditation of Teacher Education (NCATE) The University of Kansas School of Education is accredited by NCATE. Accreditation Review Commission on Education for the Physician Assistant (ARC-PA) The Physician Assistant (PA) program at Wichita State University is accredited by ARC-PA.
Nicknamed "the Little Apple," Manhattan compares to its New York namesake in that it does have a lot to offer in a little space. In addition to being considered one of the best college towns in the country, Manhattan recently made it onto the Forbes "Best Small Places for Business and Careers" list, making it a great town for both students and alumni. A large part of the economy here is education-based, with Kansas State University (KSU) being the largest employer in town, followed by the city school district. In addition to KSU, students have several other college options, including private colleges, Christian colleges, community colleges, and trade and vocational schools. K-State is a top-ranking, public land-grant research university with about 25,000 students and over 250 majors. K-State has three campuses around the state, with the flagship campus located near downtown Manhattan. K-State is a large presence in Manhattan, contributing to the economy in several ways: it has a partnership with Fort Riley, and is home to the Biosecurity Research Institute, which provides several opportunities for student involvement in research activity. There are around 500 student organizations and clubs students can participate in, including the K-State Proud - a nationally recognized student-run philanthropic organization. MSU is a small, four-year, non-profit Christian college offering bachelor degrees in Christian ministry, leadership and theological research. MCU is a neighbor to KSU, located near central Manhattan. Dual-degree programs are popular here, in which MCU ministry programs can be taken in conjunction with traditional degree majors through Kansas State University and Manhattan Area Technical College. MCU also offers accelerated programs, online degrees, weekend college, and study away programs. Its Leadership Education for Adult Development (LEAD) program is an accelerated, two-year adult education program in which students can earn a BS in Management Ethics. MATC, which is part of the Kansas Board of Regents system, is a public technical college that offers technical certificates and associate degrees. In addition to a technical and vocational focus, MATC emphasizes general education as part of their degree programs. Students can complete a degree or certificate program in 1 to 2 years, or continue on to a four-year program, as the college has transfer agreements with several public colleges throughout the state. MATC also offers continuing education and focused training for local companies through the Workforce Development Department. Popular programs here are Health Sciences, Construction and Automotive Technology. Although Wichita is the largest city in Kansas, it remains student-friendly. With high marks for livability and a wide variety of higher education options, Wichita is an excellent place to go to college. Wichita has several choices of regionally and nationally accredited colleges to choose from, including a large public research university, several non-profit private colleges, Christian colleges, community colleges, and several trade and vocational schools. Major industries in Wichita include manufacturing, healthcare, agribusiness and finance, and Wichita is home to several colleges offering degrees related to these fields. WSU is a public research university centrally located in the city of Wichita, with a student population of about 12,000. WSU offers over 100 undergraduate and graduate degrees. In addition, WSU offers several online degree options, including associate, bachelor and master degrees. WSU encourages experience-based learning, and students here will have several opportunities for applied learning experiences, internships and involvement in research projects. Some popular programs here include business, health professions and engineering. Newman is a private, non-profit Catholic liberal arts university with about 5,000 students and small class sizes. Newman's main campus is in Wichita, with outreach locations in Southeast and Western Kansas, as well as Colorado and Oklahoma. Newman offers a core curriculum/general education program called the Newman Studies program, which is based on four educational principles: Active Learning, Critical Thinking, Interdisciplinary and Connectivity. Popular programs here include nursing, education and biology. Friends is a non-denominational Christian liberal arts college with a Quaker history. Friends has a small college vibe, with a student population of about 3,700. To increase graduation rates, most traditional first-year students are required to live on campus for two semesters, which is located in a primarily residential neighborhood near downtown Wichita. Over 60 areas of study are available at Friends, including adult undergraduate, online, and continuing education options. The following list provides helpful links to college resources and useful information for potential and current Kansas college students. This website has links to all the public colleges and universities in the Kansas Board of Regents system. The Student and Workforce Development sections of the website contain useful information regarding higher education. KICA is an organization made up of 19 non-profit, independent, and accredited colleges and universities in Kansas. The website provides information and stats on the member colleges and scholarship information. Funded by the USDE, and through Wichita State University, KKGU-eligible students can get scholarships for college and get help with college applications, testing, finding financial resources and college preparation. SEP offers pre-college summer programs for both middle and high school students. Students have the opportunity to explore careers such as pharmacy, dentistry, science and engineering, and experience college life through camps on Kansas college campuses. Through public Kansas Universities such as Wichita State, TRIO offers several Upward Bound programs to help first-generation and low-income high school students, veterans, disabled and underrepresented college students with college preparation, college admissions, academic and career counseling.